It’s been a year since I’ve been blogging. The 100 or so posts add up to about 300 pages of text. One of the downsides to a large number of blog posts is that older stories tend to get buried and hidden. Categories and indexes on the web pages aren’t quite the right metaphor or substitute for random access. So bowing to popular demand the 2009 blog posts are now available on Amazon on a portable device which provides instant and random access to any post and does not require power or an internet connection. After I retired, I began teaching Customer Development, a theory of how to reduce early stage risk in entrepreneurial ventures. The first time I taught the class at the Haas Business School, U.C. Berkeley, I had a few hundred pages of course notes. Students began to ask for copies of the notes so I threw a cover on them and self-published the notes as a “book” at Cafepress.com. 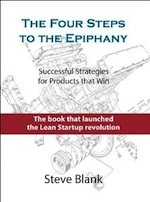 As a pun on my last company as an entrepreneur, E.piphany, I called the book The Four Steps to the Epiphany. A few years later my teaching assistants at Stanford and Berkeley said, “You tell much better stories than you write.” They suggested that sharing those stories on the web was the best way to illustrate some of the more salient points of what even I will admit is a difficult text. 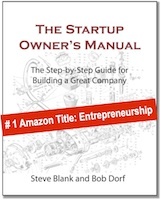 My blog also allowed me to indulge my interest in a few other subjects: The Secret History of Silicon Valley, thoughts on a career as an entrepreneur, observations about family and startups, etc. It’s possible to read this past year of posts and think that I was the only one at these companies. Nothing could be further from the truth. I’ve been lucky enough to work with, around and near some extraordinary people: Bill Perry, Allen Michels, Rob Van Naarden, John Moussouris, John Hennessy, Skip Stritter, Jon Rubenstein, Gordon Bell, Glen Miranker, Cleve Moler, Tom McMurray, John Sanguinetti, Alvy Ray Smith, Chris Kryzan, Karen Dillon, Margaret Hughes, Peter Barrett, Bruce Leak, Jim Wickett, Karen Richardson, Ben Wegbreit, Greg Walsh, John McCaskey, Roger Siboni, Bob Dorf, Steve Weinstein, Fred Amoroso, Fred Durham, Maheesh Jain, Will Harvey, Eric Ries, Kathryn Gould, Jon Feiber, Mike Maples, Ann Miura-Ko and many, many more. These blog posts were written as I thought about them, with little thought about organization by topic. 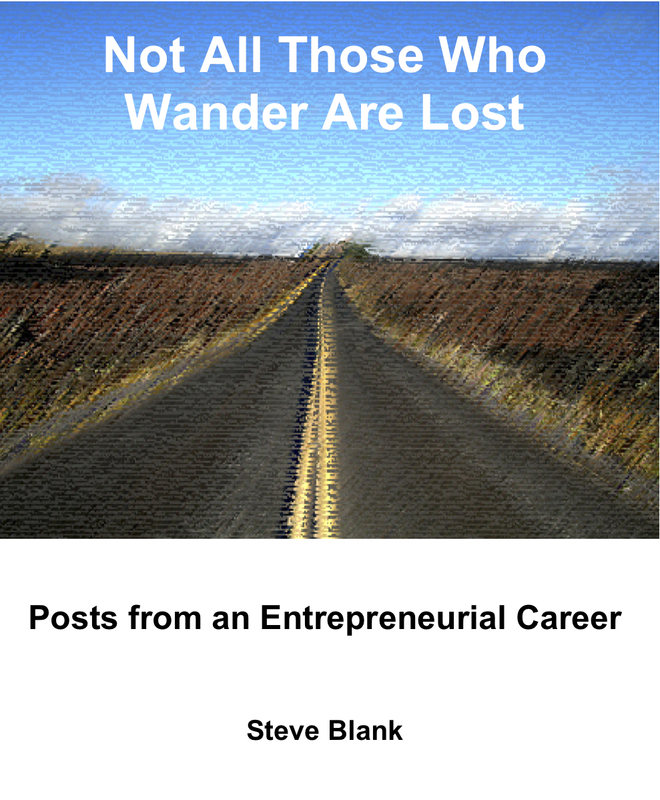 This new “book,” Not All Those Who Wander Are Lost, attempts to remedy that by organizing the 2009 blog posts in a coherent fashion. Already got one on Cafe Press. Looking forward to it as well as the end to some of the stories you’ve started. 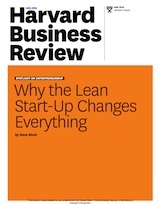 Will this book have a Kindle version as well? Possibly. But it seems to defeat the purpose. Wish there was a way to get both of your books in quantities to Russia. I just showed it last week to my junior year students in Innovation Workshop class and said “This is going to be your bible from now on”. Too bad mine is the only copy in Russia. I believe they ship to Russia and the Ukraine. Appreciate the blog to ebook editing effort Steve. I had planned on doing the same but after my first one I haven’t conjured the time (300 more posts since that first ebook). You and I share a blog birthday of sorts, my first post was Feb 22, 2009. It feels like a lifetime ago, as time has graciously slowed to a crawl while I feverishly search for traction with my first web startup, Victus Media. Grateful for all your shared wisdom, and perspective. thank you so much for your incredible posts. I believe that this is one of the most important blogs i read. Steve: Looking forward to reading “Not all who wander are lost!” I am a recent fan and this will be a great way for me to catch up. The title sounds like the “trials” part of the Campbell monomyth. Steve — if only you self-hosted, you could use the “Trailmeme for WordPress” plugin, built by my team, to comprehensively solve this problem :). The words you use are pretty much EXACTLY the “blogger problem hypothesis” for us! Your 4S2TE book, which I recently began using for the Trailmeme project (an incubator venture within Xerox), has been a lifesaver. While I’ve been using an ad hoc and improvised personal version of “customer development” since the beginning, the lack of discipline and conscious self-awareness around why what I was doing by instinct made sense, was hurting us quite a bit. I was doing more “random acts of marketing” than I like to admit. Thank you for writing it. One area where it was illuminating was in helping me make sense of the “Grabowksi ratio” (marketing/engineering spend in early-stage product launches). Historical stats show that launches are nearly certain to fail when M/E <0.1 and pretty much free of all controllable risk when M/E = 1. M/E has been another lighthouse concept for me, like CD. The problem I had was figuring out where/how to spend the M part of the budget to get it to match E. Simply trying to match engineering to marketing dollar for dollar any old way is dumb, obviously, so I was navigating by gut trying to get M/E to 1. Your CD process came as a relief, since it made it clear where the scarce resources should go: M=CD. I wonder how many other nerds like me got all excited when we read about “a portable device which provides instant and random access to any post and does not require power or an internet connection” and if the realization took me more or less time than average.